I’ll post more photos and a more detailed itinerary later, but I wanted to put these photos up quickly. 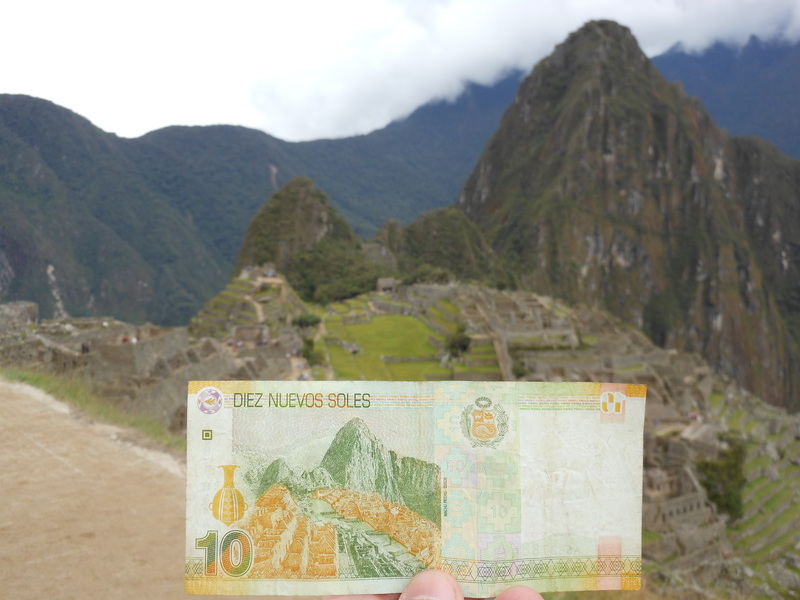 It’s my Peruvian version of going to the Lincoln Memorial and taking a photograph of it with a five-dollar bill in the frame. Stepping out of the timeline I have been using as the concept of this blog to wish one and all a wonderful and happy holiday season from the Sin Polaris family. Happy Hannukah, Merry Christmas, and Happy New Year from our Lima home to all of yours. 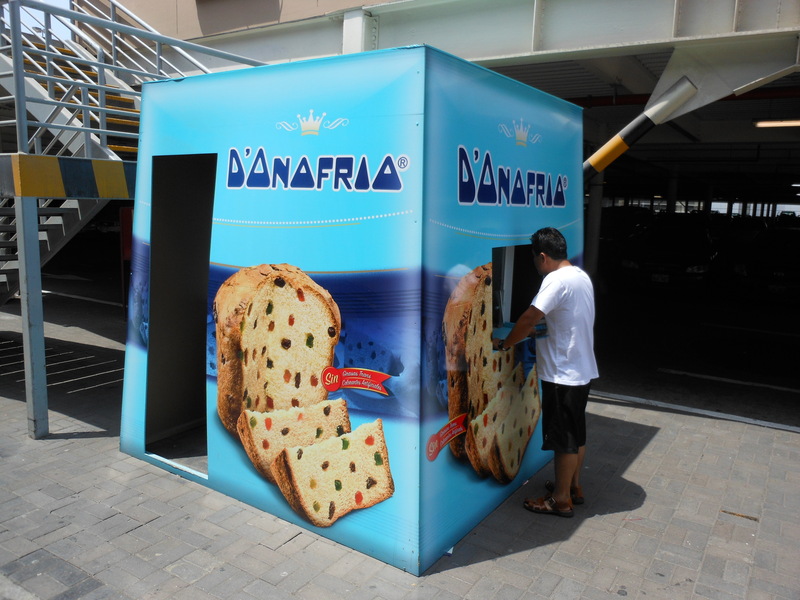 An extremely popular food item here in the City of Kings is the panetone. For a much better write-up on this cake-y delight and how popular it is, you can click on over to here. Feliz Navidad y Prospero Ano Neuvo ! For the past two weeks, we have had the phone we used in the States plugged into the Lima telecommunication system. Back in Virginia, we liked these phones because it had Caller ID, which is a wonderful way to weed out telemarketers and opinion poll takers. For the past two weeks, we had been without this feature but it was not that much of a disadvantage because telemarketers do not (knock on wood…not yet) call us. We also thought that perhaps Peru does not offer this service. Turns out it was a wrong number. Happens here too. 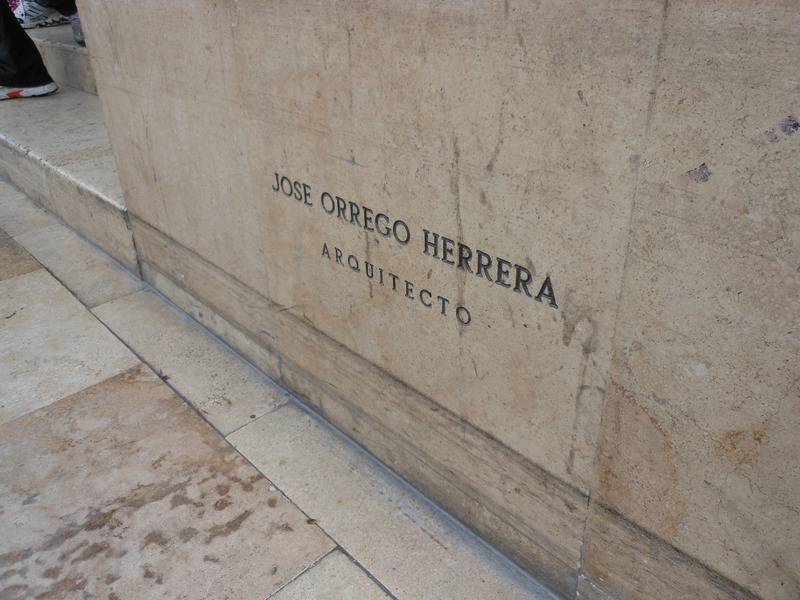 As I’ve written before, this is a country that likes its architects and this cornerstone inscription seems to bear that out. I had written earlier about Peru’s La Semana de Bandera, which is the time when all Peruvians fly their nation’s flag. In that posting, I had wondered when the red and white banners would start coming down. Today was that day as my neighbor’s flag was put away a week after Peru’s independence days holiday. Seems like a good place as any to leave this reminder that I have another blog space, Periodically, Peru, where I attempt to learn all that I can about this country through newspapers. Before making our move to Peru, I remember telling my kids while we were still in Virginia that there was only one thing that I was definitely going to miss. It wasn’t family and friends (sorry) because thanks to the series of tubes known as the Internet, our group of five would be able to keep in touch with folks back in the States. All hail e-mail, Skype, and Facebook. When I made this statement to my children, we were walking to the one place that I was going to miss during our sojourn to the City of Kings. I was going to miss California Tortilla. Nowhere in Lima would I be able to enjoy the wide variety of burritos as they are offered at CalTort. In fact, I’m not even sure that the burrito is a staple of Peruvian cuisine. For that matter, I’m not even positive that Mexican cuisine holds the burrito in its pantheon. While it was true that I was going to miss the great food and the wall of spicy sauces at California Tortilla, what I truly really was going to miss was the music they played at our establishment in Ashburn, Virginia. That California Tortilla played nothing but ’80s music. Ah, the look of bored resignation that would come over my kids’s faces whenever I would wax nostalgic about Men at Work, The Police, Van Halen, Robert Palmer, Adam Ant, or any other musical act that was big when I was lad in high school (1982 – 1986…thanks for asking) was the extra salsa on my burrito that made our outings that much more special. So, when coming to Lima, I was resigned to the fact that if I wanted to hear my music, I would be confined to my iPod and Pandora (thank you again, you magical series of tubes). Oh, dear Heaven above, how wrong I was. Well, here is that other posting. In the local grocery store in Jockey Plaza, the music that is piped in from the ceiling to entertain the shoppers was nothing but music from the 1980s. There was Phil Collins with “Sususido”, The Bangles with “Walk Like an Egyptian”, Huey Lewis and the News with “The Power of Love”, Pat Benatar with “Love is a Battlefield”, and (my personal favorite, and wtih a great video to boot…and now you know way too much about me) a-ha with “Take On Me“. Not only is my local grocery store a fine purveyor of aural nostalgia, but I have since discovered a radio station, Oxigeno (102.1 on your FM dial), that dabbles in “Los Anos Ochenta” (that would be Spanish for “The Eighties”). If I can hear “Sultans of Swing” or “Money for Nothing” on the radio or while shopping for butter, I know things are going to be okay and that I can enjoy my burrito-less environment. Our plan for this Saturday included an outing to Jockey Plaza, a mall located in the suburban area of Lima, Peru. First on our treasure hunt was the quest for a charger for a mobile phone that went missing during our move. This quest was unsuccessful and the phone remains sans electricity. Our second-to-last stop was Ace Hardware. This establishment selling all things related to home improvement is one of the pair of business occupying this market space. Whereas Home Depot is Ace Hardware’s competition in the United States, here Ace contends with a company called Sodimac, which to my ear sounds like a soft drink you buy at McDonald’s. It was here at Ace that we did not find a lock for our oldest son’s locker (luck was truly not smiling on us for this shopping trip), but we did find a shower caddy for our busy place of washing. We finished our mercantile excursion with a stopover at a grocery store. My audio impression of that portion of the trip will wait for another posting, because I really wanted to discuss something that happened at the start of Jockey Plaza adventure (wow…talk about burying the lead). Since we are a family that is grumpy when hungry and “shopping while grumpy” is not a state that sits well with any member of our family (and it usually ends with a pout-fest being thrown somewhere…yes, I stand guilty), we kicked off our Saturday outing with a stop at the Food Court. My oldest son, my daughter, and myself went to Bembos and enjoyed their hamburgers. My lovely wife and middle child went to a sandwich shop. It was when we were back at the table that I noticed something odd in the receipts. My piece of paper from the hamburger place had a line containing the extra tax we paid, while the receipt from the sandwich shop did not. 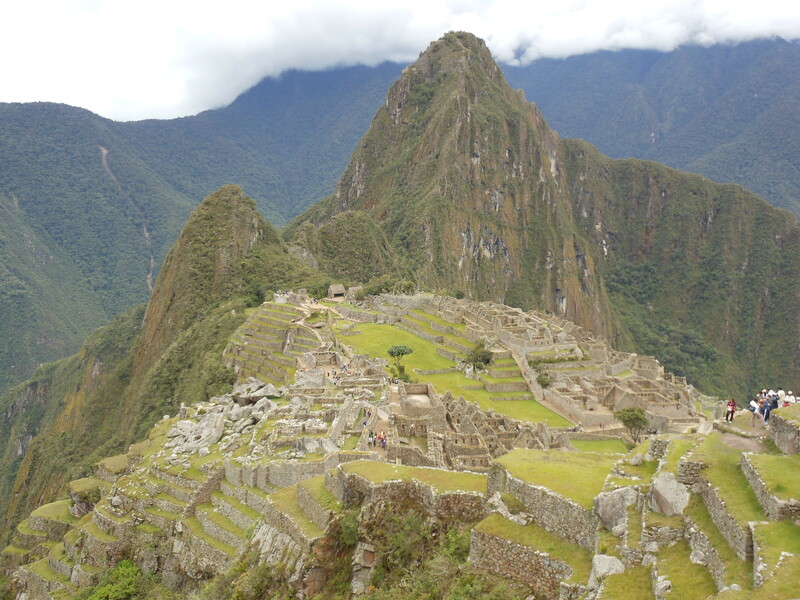 Here in Peru, the sales tax is known as the IGV, which stands for Impuesto General a las Ventas. Hovering around 18%, this surcharge is added on to every purchase that I have seen so far except for taxis. While the IGV is a steeper sales tax than I am used to in the States, there is one beneficial difference between any state’s version of the sales tax and Peru’s IGV. Here in Peru, when you see the price for something on the shelf, that is the price you will pay. As you stare at that shower caddy, there is no need for a mental calculation to add in the 3%, 5%, or 7% depending on your state. In Lima, what you see is the price you pay. So why did Bembos include the IGV, but the sandwich shop did not? Was this provider of meat-on-bread goods skirting the law in some way? Have I uncovered some dastardly deed of skullduggery most unpleasant? Probably not and it will most likely remain a mystery to my Northern Hemisphere mind. But not as a big a mystery as scented coasters. 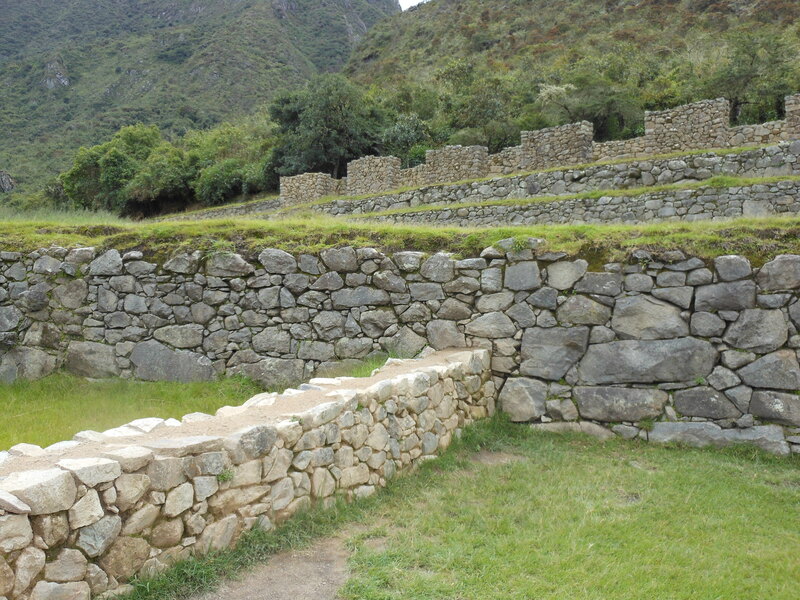 In addition to being exposed to new culture, the opportunity for our children to learn a foreign language, and the ability to travel to new places, one of the other things that made my lovely wife giddy about the prospect of moving to Peru was the chance to hire a maid to cook and clean for us. My wife grew up in a Latin culture where employing a maid is common. Growing up in the United States as I did, this was not as common despite my upbringing in a comfy middle-class suburban environment. Yes, we had a cleaning woman (and right about now, two of my friends are doing their best Steve Martin impression from his movie Dead Men Don’t Wear Plaid), but I would contend (or rationalize) that having a person come by once a week to clean is different from a person who stops by every day to cook dinner, do laundry, mop the floors, buy groceries, and do whatever else needs to be done. I was not 100 percent comfortable with hiring a maid. So far, in the two weeks that we have been here, all the other people from the States that we had met had told us how fantastic it was to have an empleada, which is Spanish for “employee” in the broad sense, but a more specific meaning is “maid”. When I expressed my reservation about having someone in the house during all hours of the day while I was there, to a person, everyone told me that those feelings would go away in a few weeks after the maid was doing her magic. I was still not 100 percent comfortable with hiring a maid. My lack of being onboard the Maid Express had nothing to do with any feelings of guilt about hiring someone to do our dirty work. I am a person who follows an “aspire-to-hire” philosophy. I am not a handy-man in any way, shape, or form. If there is something that needs to be fixed, mended, repaired, or built, I am happier than a spider sitting in a web full of trapped flies to hire someone to do the job. My time is important to me and if someone else can do the job, then they should do it. In addition, they could probably fix, mend, repair, or build it better than I. So why was I still not 100 percent comfortable with hiring a maid? Because, deep down, I thought I could be a wonderful house-husband. For years, my lovely wife had cooked and cleaned and kept a wonderful house while I worked in Cubicle-Land. Here was my chance to repay her and do all the house-y work she had done. The one flaw in my Grand Scheme was that I had no real skills in the this arena. I can cook, but not well. I can clean, but not well. Once that domestic delusion of mine was discarded and disposed, we set about to find a maid. This is why we found ourselves on this Saturday morning sitting in our living room interviewing Candidate #1. However, with my inability to speak Spanish at more than the level of a three year-old, the interview was a two-way conversation between my wife and Candidate #1, who from this point on we’ll call Ethel. I was along for the ride watching my wife lob questions at Ethel, Ethel answering them, and Ethel showing us her references. I had my questions, but they would have to be translated by my wife and Ethel’s answers would also have to go through the translation engine that was my wife. When the Babel Fish is finally discovered, I will be first in line to buy one. It was odd being merely a passenger in this transaction about who would be spending eight hours a day in our house Monday through Friday. Whereas my lovely wife could glean information about what type of cleaning products Ethel used, what her favorite recipes were, and how long it would take her to arrive at our house, the only criteria I could rely for our potential empleada was her demeanor. In the end, while we liked Ethel, we had other candidates to interview and experience has taught us that you never go with the first choice. I’m not sure why, it’s like one of those rules I’ve heard about like washing your hands after handling chicken or not using the sink sponge to clean the toilet. See what I mean about my domestic skills. I guess company mascots do not transcend borders. At the checkout counter of our local grocery store, I glanced at the impulse item selections and saw a rack of batteries. At first, I thought I was looking at Energizer batteries because the mascot on the package was a pink bunny. However, this rabbit was neither wearing sunglasses nor wielding a drum. Turns out Duracell here in Peru uses a pink bunny as its mascot (click here to see a commercial featuring it). After my visit to the grocery store, I stopped by the nearby bookstore to windowshop. My poor language skills prevent me from buying anything inside this store, but I was curious to see what is popular in a suburban Lima business of reading. One title caught my eye (and thankfully gave it back). The book was called El Imperio Invisible written by Daniel Estulin. The title translates as “The Invisible Empire” and in my best Spanish, the subtitle says this book is “The authoritative (or “official”?) conspiracy of the shadow world government”. Estulin is also the author of a book about The Bilderburg Group, a meeting of global movers and shakers that is a lightning rod with conspiracy theorists because their meetings are closed to the public. Think of Bilderburg as the World Economic Forum in Davos, Switzerland, but without the red carpet. I know of the Bilderburg Group because it was wonderfully discredited as the group that runs everything by the book Them: Adventures With Extremists by Jon Ronson. An entertaining read. It made me smile to think that the tin-foil hat mentality is not confined to the English-speaking world. And with that Day 014 (and Week 2) was finished. The setting is our local grocery store where I am on my daily outing to buy foodstuffs for our abode. I am at the caja (cashier) having the items scanned and giving my standard answers to the two questions the seated woman is giving me. The first is “No, no tengo tarjeta” (No, I don’t have a card). As in the United States, loyalty programs are big here in the large name grocery stores. However, I do not feel confident enough to fill out the application forms, so I haven’t even asked for one. The second is “Boleta, por favor” (Boleta, please). There are two types of receipts given out by cajas. Boletas are given to private citizens and the other option, factura, is given out to people buying things for a business. Since I don’t own a business, buy for a business, or even know how to say “business” in Spanish, I always answer boleta. Once the whole transaction is completed and I tell the cashier the latest phrase I have learned, “Que tenga buen dia” (Have a good day), I walk away and look at my receipt. Dang it! I grouse to myself. My total bill was for S/. 16.58. That total reads as 16 soles and 58 centimos. An interesting thing to note about Peruvian monetary transactions is they like to round up or down to the nearest 0.05. Yes, there is a 1 centimo coin, but it is rarely used. Therefore, sums are rounded are down or up. Sometimes you win and sometimes you pay. Overall, it has averaged out to a wash.
My total of S/. 16.58 was rounded up to S/. 16.55. Now, I know that my eighth grade math teacher would have a fit at this because, as he taught us, a ones digit of “8” should be rounded up. However, since Mr. Wilkinson was not here in this grocery store in Lima to complain, I dutifully made my payment. I handed over my 20 soles bill, but in an inspiration of uber-helpfullness, I also fish out 60 centimos. This completely flusters my cashier. It is nice to know that some experiences transcend countries because I have been known to bring lines to a screeching halt with my tendency to pay the exact change. I’m not sure what it is that causes the cerebral functions of a person at an electronic cash register to freeze up when presenting with coins. I’ve caused this condition in the United States (most notably at fast food restaurants) and I’ve done the same now in the Southern Hemisphere. I so unhinged her that she rang up the amount of money that I gave her as S/. 21.00. Now we were in a bind because the amount of change her machine was telling her to provide to me was not the number I should receive. Breaking out the old-school method of pencil-and-paper, the cashier works out that I should receive S/. 3.05 in change. She hands me three nuevo soles coins and a five centimo coin and as I walk away to look at my receipt. I do my own mental math and realize that my change should have been S/. 4.05 (20.60 minus 16.55). I’m still only fifteen feet away from the cashier, but without a grasp of the language, I don’t feel comfortable explaining my arithmetic or complaining about one nuevo sole. In the end, it’s only $0.36 that we’re talking about. I will never complain about any job that I have held or any future cubicle-dwelling employment I will have the pleasure of attending. I once worked as a courier in the Southern California area so I became fairly adept at navigating the byways and highways of the counties of Los Angeles, Orange, and San Diego. However, I only delivered inanimate objects (e.g., blueprints, legal documents) and they never complained if I was a wee bit late. The people receiving said inanimate objects were another matter, but I only had to deal with them for 30 seconds. I have a healthy dose of respect for the cabbies in Lima who have to deal with the insane traffic and the less-than-stellar roads. So far, in my dealings with taxi drivers from our house to school (and vice-versa), I have noticed that there are four different ways to start at Point A and arrive at Point B. Now that I know there is a back-back-back way which actually avoids Ovalo Monitor (aka The Circle of Death). I have begun to tip my hack based on the cleverness of his route. On the traffic island on the main street in our neighborhood, I saw workers planting grass in the city’s attempt to beautify the district. What is different about this exercise in planting grass is that the workers are not using sod, carpets of grass that can be rolled out onto the dirt. Instead, as if they were on a rice paddy, the workers were hand-planting individual packets of the green stuff. Was this the most efficient way to do it? Probably not, but I’ve commented on this tendency before. As I have espied city workers manually sweeping the sides of the street with only a broom and I have seen folk cleaning outside plants, those occupations can be combined into one profession as I saw, on Skateboard Hill no less, people wearing the uniform of our district on their knees washing the Botts’ Dots, the reflective lane markers embedded into the asphalt. Did I mention that traffic was driving around them at the same time? 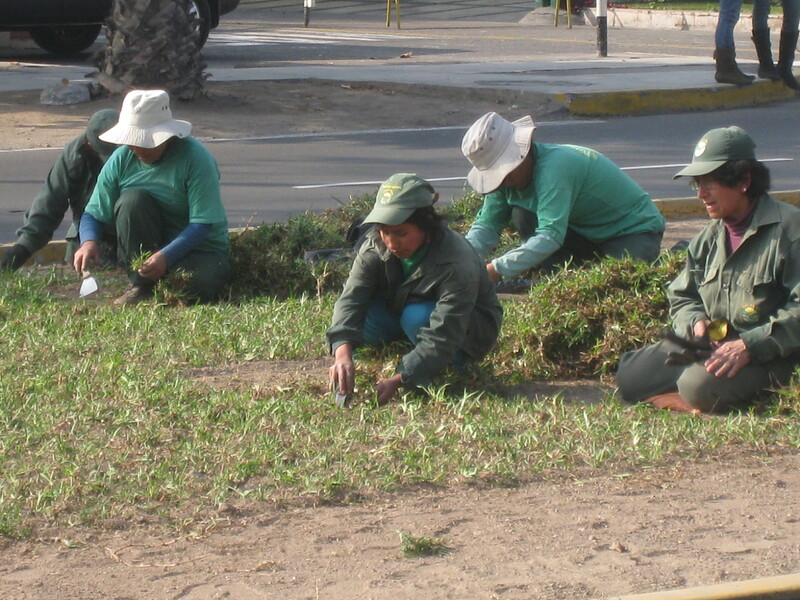 In our suburban area of Lima, wherever there are parking lots, we will see these workers. After a car is parked, these helpful folk will come up and ask if the driver if they want their car washed. 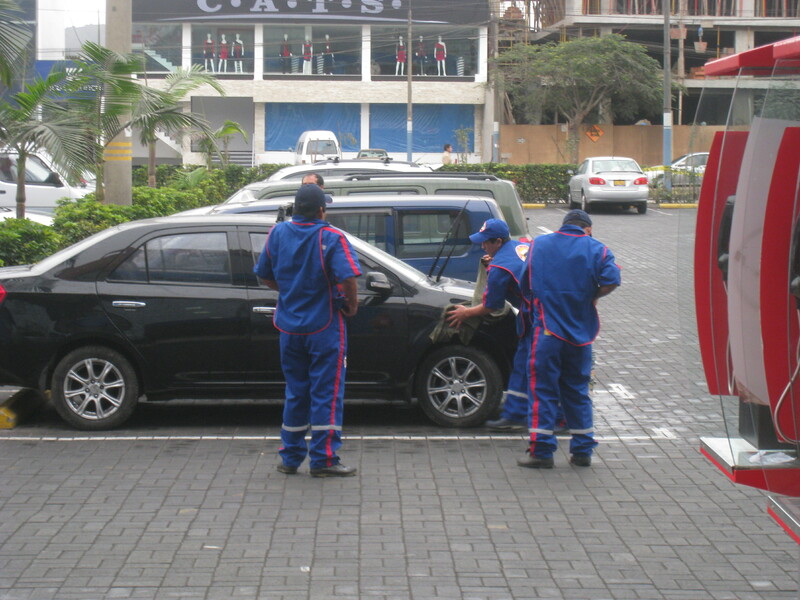 For a few soles while you shop, go to the gym, or eat, these workers will clean the dust off the car. In the picture above, the windshield wipers are up which is a code to let all know that this car is being washed / has been washed. Where I lived in northern Virginia, raised wipers meant really cold weather was coming and we didn’t want the rubber of the wipers to freeze to the glass. Hmmm…I wonder what other gestures are the same, but mean completely different things. With a Wave of My Hand…Magic! I’m neither the first nor the last hunt-and-pecker to inform the e-masses that driving in Peru is not for the faint-of-heart. While it must be said that Peruvian drivers do stop at red lights and stop signs (although here they have PARE as their warning text), this is most likely only one of the three driving rules followed. The other two are don’t smoke at a gas station and ALWAYS obey the police officer making hand gestures. All other rules of the road (i.e., lane markings, turning from an appropriate lane, distance between cars) are merely suggestions that drivers in Lima are free to adhere to or ignore as their whim allows. By no means should the reader be left with the impression that Lima’s roadways are choked with the remnants of accidents and fender-benders. Surprisingly, despite the (to my mind) chaotic and pell-mell nature of driving, I have seen few accidents. It’s as if some unseen force manages to keep all the autos, trucks, and taxis from crashing into each other much like how similar poles of a magnet will repel each other. I may not know what that force is, but I know its origin: the left hand. 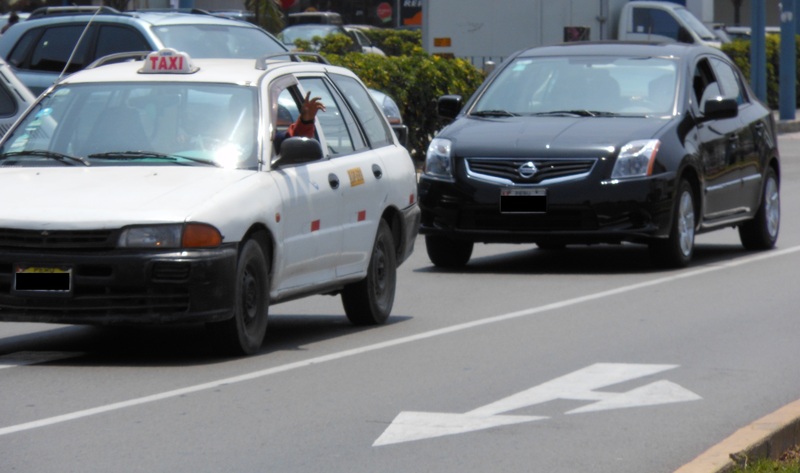 A ubiquitous sight on Peru’s asphalt is a person, whether it is the driver of a taxi or the assistant of a combi, wave their left hand out a window in a back-and-forth motion similar to as if they were shooing away a fly. Peruvians will use this gesture right before they execute a maneuver that would make them fail a Driver’s Ed test , but would be worth bonus points in Grand Theft Auto. Cars are only dangerous when the hand is sticking out....LOOK OUT, black car! This hand-waving is enough to make all drivers sit up and notice and give this lunatic a wide berth. In the same way that there is professional courtesy among businessmen, all drivers know to pay attention to the hand because they know they, at some point in the near future, will also have to call upon the magic of the left hand. And, really, a tradition and culture is only as strong as the belief the people have in it.